A friend recently said something about how Fragile X has affected his family that I related to immediately. He'd planned a family visit to Disneyland right after the Conference ended last week, only to end up leaving the son with Fragile X back at the hotel room with his older brother, and taking just their unaffected son to the happiest place on earth. What was supposed to be a family event became another example of the way Fragile X divides families. To recognize Fragile X Awareness Day, I'vedecided to illustrate the way that Fragile X has disconnected our family. I can't count the number of times we've taken two cars to celebrations and events so that when the boys need to leave, Aliza doesn't have to. She is eleven and has yet to have a birthday party where her brothers were able to participate, which means that Mark and I are almost never both able to go to her parties. Family picnics, play dates, dinners - lots of outings end up being attended by Aliza and Mark, or Aliza and me. The boys often "make an appearance" before one of us ends up taking them to wait in the car, if not all the way home. Our family "vacations" usually consist of research trips. The five of us have all gone together several times, when the boys had an appointment of some sort out of town, and used it's a excuse to semi-vacation. The only true vacations we've taken, though, have been just the three of us, with the boys staying with one of or both my parents. A vacation, while so necessary for recovery and relaxation for the rest of us, is just a forced separation from their comfortable routine for kids with Fragile X. Things that should be fun, like Disneyland, are so filled with anxiety, overstimulation, and hyperarrousal they are more torturous than enjoyable. Fragile X actually makes a kid choose solitude in a hotel room to Disneyland. The number of times the five of us have sat at one table for a meal are so few, when it happens I have an urge to get out the camera. Fragile X makes us a disjointed family. All families have a bit of a divide between the children and the parents. Parents are grown ups. They go out for dinner, a babysitter comes. Parents go to work, kids go to school. The kids have sporting events that the parents attend, and siblings play together, fight each other, share things together, steal from each other, and rebel against authority together. Only in our family, Fragile X prevents our kids from having a typical sibling relationship. Aliza is a lot more like a surrogate parent to her brothers who are only two years younger than her. It's not always awful. Although her relationship with her brothers isn't a normal one, it's a good one. She adores them and the feeling is mutual. 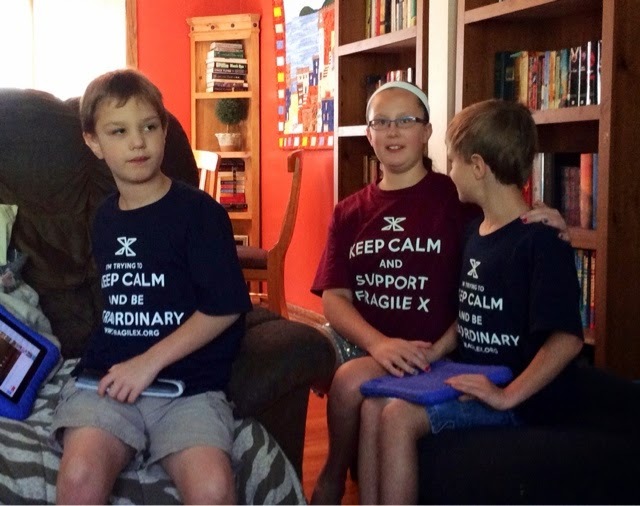 Trying to get them all to pose for a picture in their Fragile X shirts, though? Impossible.